This how-to assumes you've already got the default install of Firefox, so we won't go into downloading and installing. Firefox is an easy-to-use and fast web-browser from the Mozilla family that has been successful beyond all ambitions, taking a huge share of the browser market from IE. Tabbed browsing, where you can have several pages open at once in a single Firefox window. Built-in pop-up Blocker. If you enable this feature then by default, Firefox will block all pop-ups that may occur. If you would like to allow pop-ups from certain sites, then you can configure the pop-up blocker to allow them from top-level or individual addresses. Extensions- there is a vast number of add-on programs that extend the functionality of Firefox. Profile Manager - This will allow you to create different profiles, each with their own bookmarks, cookies, and settings, for users who use Firefox from the same account. The interface of Firefox is very similar to Internet Explorer. The crucial buttons may look different but do the same things; page back, page forward, reload, stop and go-to-homepage. To refresh the page, hit the F5 key. The address bar gives you some useful assistance (below), just type an address, hit the enter key or click the green triangle to 'go'. 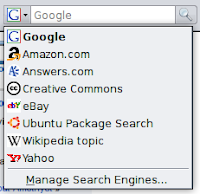 By default, Firefox version 2 comes with the Search toolbar installed which provides quick-access to web searches. The drop-list (click on the black triangle to activate it) allows you to choose from the leading search engines. 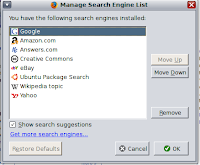 The last option, Manage Search Engines lets you add, delete or configure preferences for Search Engines. The file menu has equivalents of most of the options as IE, with the addition of New Tab (shortcut keys combination is Control and T) which adds an empty browser tab with the cursor in an empty address bar ready for you to go wherever you want! Any other pages you have open are still there in their own tabs running across the screen; just click on the tab-top to make one active. Those are the basics by which I do 90% of my web-browsing. Don't worry, menus are remarkably alike in Firefox compared to Internet Explorer, but if do you get stuck, click the Help menu or function key F1. You can search by keywords if you are looking for something specific. Page text is fully resizeable, even if the page layout isn't – blame the website designers, not Firefox if the layout breaks down. From the menus, View > Text Size provides choices to enlarge, reduce or reset to whatever is 'normal' for the page you're viewing. Otherwise the key combinations Control with + (plus) or – (minus) enlarges and reduces the text size by increments. Firefox lets you enter partial locations or text strings in its location bar and tries to match them with any previous sites you've visited and will show you the page title that goes with it. Your 'favorites' are now known as 'Bookmarks' and can be located under the Bookmarks menu. To save a favorite page, click Bookmarks > Bookmark this page. The shortcut keys are Control and D. You can organize bookmarks into folders, similar to the process in Internet Explorer. If you want to do a thorough spring-clean, select Bookmarks > Organize Bookmarks. This opens a child application called Bookmarks Manager which works similar to a file manager. Extensions are similar in function to ActiveX controls for IE. You can configure extensions by selecting Tools > Add-Ons and explore the library of extensions available by selecting the 'Get extensions' link at the bottom of the Add-ons Manager – this will take you to http://en-gb.add-ons.mozilla.com/en-GB/firefox/2.0.0.13/extensions/ (the address may vary with your version). Extensions range from a Google toolbar, through card games and utilities. My most-used is Fireftp which is a handy file transfer add-on. History is much the same. You can set the number of days, etc. and customize it to your needs. Select History > Show in Sidebar or use the shortcut keys Control and H. You can search the page addresses for keywords here too. Firefox has a password manager for all your websites, so you can save passwords inside the browser, if that is something you prefer to do. When you opened Firefox for the very first time, the Import wizard should have asked if you wanted to import Favorites from another browser on your computer. This is useful if you have dual-boot and file-sharing with a windows partition for instance. You can access this wizard at any time by choosing File > Import. Follow the steps in the wizard to import your IE Favorites. You can also export favourites as a file from Internet Explorer on another machine then import this through the Bookmarks Manager. 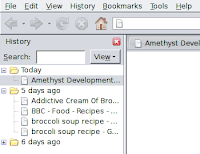 From the Bookmarks menu, select Manage Bookmarks. Under 'Import Bookmarks from:', select From File. Click Next. Browse to the location where you saved the Favorites you copied over and select that file; usually bookmark.htm, unless you changed it. Click Open. Your Favorites will now be imported into Firefox. Main: controls start-up, homepage, downloads and default settings. Tabs: set how Firefox behaves for tabbed browsing. Content: along with behaviour for handling images and pop-ups, you also get to set your own defaults for fonts and colors – these will override whatever is on the web-pages you visit. This creates and applies a user-defined Cascading StyleSheet (CSS) to pages viewed in Firefox. Feeds: tell Firefox how to handle RSS sites and subscriptions. Privacy: sets how long Firefox keeps history, by content-type, what to do with cookies and, importantly, has the Private Data options – set these before you use the Tools > Clear Private Data command from the main menu. Security: invokes rules for installing add-ons and checking web-sites' identifying certificates. The Firefox password manager is also invoked from here. Advanced: the last tab controlling language preferences, connection settings, automatic updates and encryption. That's what we need to do in order to make Firefox the number one browser. IE is still in the lead based on the number of users worldwide. There are many sites that have been created specifically for Internet Explorer that may not look or function as intended when using other browsers. So if you visit a site that fails to render properly, it is rarely the fault of Firefox, but generally the way the site designers have coded for IE and its 'eccentric' approach to standards.